Each box contains 5 ses. Each s contains 101 cards. The Caster Chronicles Angel's Waltz vs Demon's Rondo Starter Deck Set box includes 5 starter sets. Each set includes one of each deck. You can play this with your friends immediately when you buy just one set. The casters who appeared in previous sets change their costumes to Angel or Demon and increase in ability. A great product for experienced players or beginners. The power of the decks is similar to that found in Magical Dream 7. 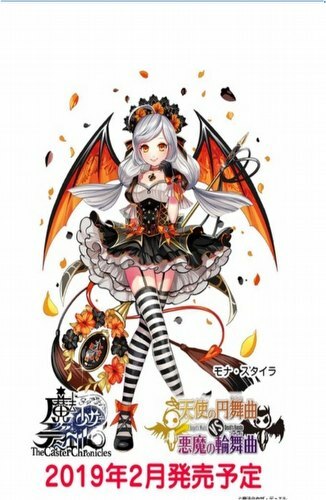 Casters included are Mona Styla, Passion Wing, Forre Mellow, Glory Butterfly, Ruka Eremi, Zoi Russel, and Maisey Queen in Demon's Rondo, and Marigold, Fianma Fantasia, Chopart, Tina, and Eren Shila in Angel's Waltz. In addition to the two decks, each set includes a play sheet, a rule sheet, a game manual, and a Saaya Matsui foil promo card.